A small group of keen trampers left Shane’s place at just after 7am Saturday morning 11th August; destination Pirongia Forest Park. After a short stop for the obligatory morning coffee at Ngaruawahia BP station, (other goodies were also purchased) we headed towards our starting point, Grey Road car park in Pirongia Forest Park. We set off from the car park around 9.45am for our destination, Wharauroa Lookout, with an elevation of approximately 850 metres. 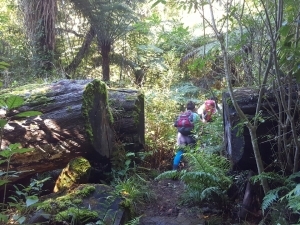 The Mahaukura Track starts at the end of Grey Road and climbs through tawa forest to the lookout. 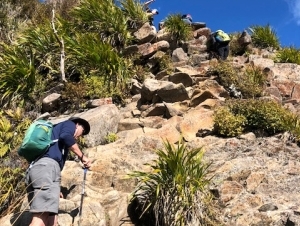 The last 30 metres before reaching the viewpoint are quite steep and chains have been bolted to the rock to guide you! 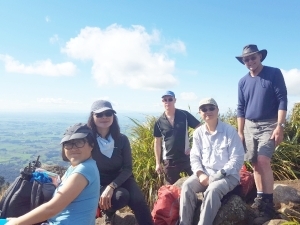 Our team made it to the lookout point around 12.10pm. 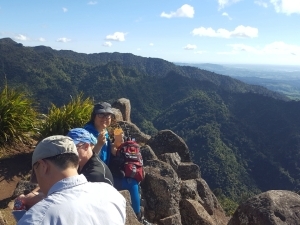 Lunch at the top was a welcome respite; a time to rest, recover, enjoy lunch together and take in the magnificent views. I must make a special mention in my report of Hua Dai who kept our spirits up through this trek with some wonderful operatic renditions of songs from Phantom of the Opera and My Fair Lady. What a treat – opera with the backdrop of the NZ bush – could you ask for anything better! Thank you Hua. We continued on going downhill most of the way, placing strain on a different set of leg muscles in the process, arriving back at our starting point around 3.00pm. Just to wind down from our excursions we took the hour long Mangakura Nature Trail walk also accessed from the car park. It is a beautifully set out walkway with lots of information stations along the way giving us all educational insights into the NZ Native Bush. Back at the car, tired bodies changed out of boots etc. ready for the drive home. We arrived safely back at Wattle Downs around 5.45pm after a very enjoyable day tramp with a great bunch of people. Unfortunately because we were a bit short on time heading back to Auckland in time for the rugby, we had to skip the traditional ABTC coffee/ice cream stop and debrief that normally takes place on the homeward journey from such outings.